After the heat of June the month of July brought nicer weather: lower temperatures and a welcome amount of rain on a number of days. It started poorly though, with a severe storm. The Journal de Bruxelles had news again about Pierre-Jean-Joseph Parent (← 13 June). A second pamphlet he had written in June about the, in his view, show trial of March, was quickly seized by the police, but the text, posted at his house at Rue de la Madeleine 74, drew crowds of interested people. Now he had issued a third pamphlet, which was quickly confiscated again. This time Parent (not related to Zoë Parent) had gone too far, in insulting judges and other high “fonctionnaires public.” Not long afterwards he was sentenced to two years in prison. The same newspaper wrote about a ‘petition of a great number of noble habitants of the manufacturing districts of the north and northeast of Yorkshire, complaining about the distress of the people. L’Indépendant gave figures for June of travelers from London to Ostend. On 39 journeys 620 people had been brought to Belgium. The number of passengers had sharply increased, due to lower tariffs, caused by the fact that the General Steam Navigation Company now had to compete with a Belgian company sailing between Antwerp and London. More ships had become available, and the average number of passengers per ship had increased by more than 50%. 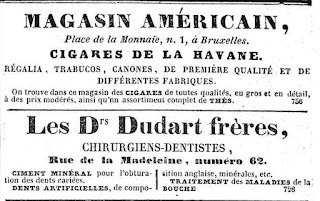 The newspaper also had an advertisement for a cigar and tea shop. Maybe Heger bought his cigars there, at least sometimes. 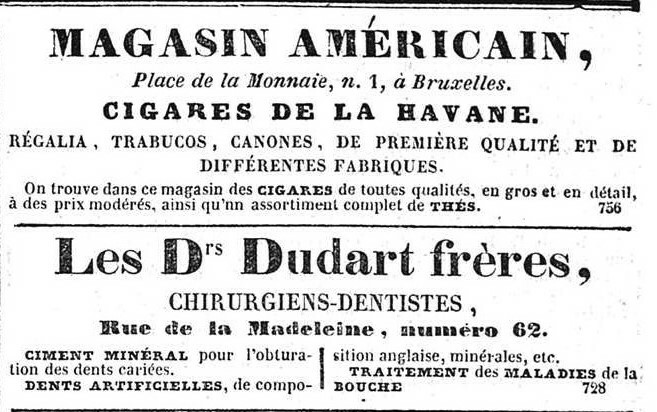 Twelve days later there was an ad for another cigar shop, at the Rue de l’Infirmerie. There will surely have been more shops where one could buy cigars. Below it a dentist ad can be seen. Dentists often advertised. There was one very close to the statue of Belliard too. As the starting point for each broadcast, Kristien Hemmerechts takes a quotation from one of the Brontës, drawing on their novels, letters (including Charlotte’s letters to Constantin Heger), Emily’s ‘diary papers’ and the French essays written by Charlotte and Emily in Brussels. 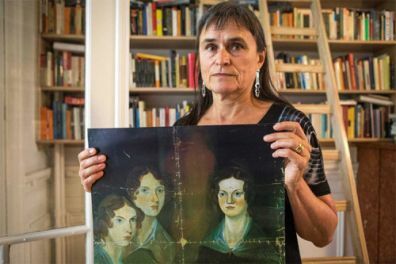 All four siblings are discussed; one of the talks is dedicated to Branwell. Look out for the ninth broadcast, which discusses Charlotte’s attitude to Brussels and the Belgians! And in the last of them, the Brussels Brontë Group gets a mention.